The ancient Vikings Social structure was relatively simple, and followed many of the common traits all societies exhibit. Of course in every society there are the high status members and the lower status members, Viking society was no different at all. Being a member of upper echelon of Viking society obviously offered plenty of rewards and benefits, and was held by the Viking Kings. At the lower end of Viking society was the Thralls, the slaves of the Viking world. In the middle we had the Viking people, separated into two main classes the Karls and the Jarls. As we learn more about the details and intricacies of the Viking social structure we will learn more about the main classes that existed here. One point to note before we go further is that it’s easy to simply define the Viking society order to these four classes of kings, jarls, karls and thralls. Of course it’s not that black and white, and as we will mention later it was common to have a variety of levels in each class. Being a king of any land or country was a prestige and to rule as a king in Viking times was exactly the same. The king like anywhere in the world was the top of the heap and in Viking times the lower classes, specifically the jarls, and the successful land and farm owning karls would report to him. The king would earn money through his people, the noble folk also. The jarls would provide a decent portion of this, and land owners would of course provide the king too. Additionally if a Viking committed a crime that involved the revolution of his land and property, this would also become the kings property. On the other side of the coin, being king also required that money be spent in various ways. Ruling was a costly business, and a Viking king if he didn’t know already would soon find out after obtaining the throne. It was the kings duty to ensure that the national security of his realm was safe, this meant having close and trusted men to hand ready to fight for him at a moments notice. To ensure the loyalty and performance of this men, he would need to ensure they were suitably equipped and also shared in some of his spoils. The king would provide clothing, weaponry, food and drink and women if the men desired. It was of the utmost important to any Viking king that he had trusted and close men to ensure his safety. The king would also have to ensure his image was satisfactory, his clothes and jewellery needed to be the best, and his home and grounds needed to give the right aura to match his status. Achieving the required look and presence of a king could be a costly but necessary pursuit. The jarls were the upper echelon of the freeman in ancient Norse society, either noblemen or wealthy landowners, merchants or traders. Jarls would likely have many men under their employ, whether they were farm hands, craftsmen or sailors. It was up the Jarl to keep them men in their employ, and often they would reward them with food and drink. Extremely noble or prestigious jarls would often liaise with the king, keeping him abreast of news and knowledge and of course contributing some of their earnings to the king. What is interesting in Viking society is that progression was allowed, a karl could in fact become a jarl should the Gods favour him. 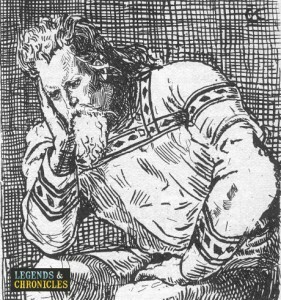 The karls were the main population in ancient Norse times, the every man of the Vikings. The karls were considered what is known as ‘freemen’, meaning they were free to own land, build property and start a family or business. Most Vikings were farmers, and the karls definitely were, even if they had another occupation like being a blacksmith or a craftsman a karl would know how to work the land. Karls were free to own slaves, known as thralls to help out with daily chores and tasks. They would use the slaves to help with their farming, cleaning or cooking. Its important to note that not all Karls had exactly the same life. Karls for example ranged from farmers who owned their own homes, to hired help that would help the land owners perform their daily chores. In return the land owner would provide board and accommodation for the helpers. Both were still freemen in Viking society, and under the class of the karl. Slaves in ancient Norse times were known as thralls, and they were the lowest rung on the Viking social ladder. Thralls had little to no rights in Norse times, they were not able to own land and they would perform jobs and chores for their owners. With all this considered however its important to note that the bad treatment of a slave was looked down on. Many thralls were treated well by their owners. Thralls were acquired in a number of ways, captured in war or on a raid, through trade or barter, or through a crime and punishment. In addition someone could even be born a slave should a thrall woman give birth. Life wasn’t all bad though, a thrall was able to own some money, although there was a limit on how much they could spend. They were allowed some free time, and could visit the market if they desired in this time. Its also known that thralls were free to marry, although as we previously mentioned children bore of this would become slaves themselves. Freedom was possible for a thrall however, their shining light and hope I’m sure. Even when free however a slave would not be considered a freeman’s equal, and it could take generations before the thralls lineage would be able to own land themselves. While not truly a class but rather a state of being, there were of course some Vikings that did not own their own homes at some point in their life. To be poor or homeless in Viking times was not an appealing option. The rest of the town or village would look down on anyone that did not have residence and begging was not favoured. A karl or even a jarl could become homeless, a vagrant and would be treated appropriately if this happened. While the Viking social structure seems simple at first, its got many facets to its primary structure. As a freeman you had the opportunity to own land, to farm, and to improve your status. A karl could progress to a jarl, and even a slave could become a freeman should the stars align for them.